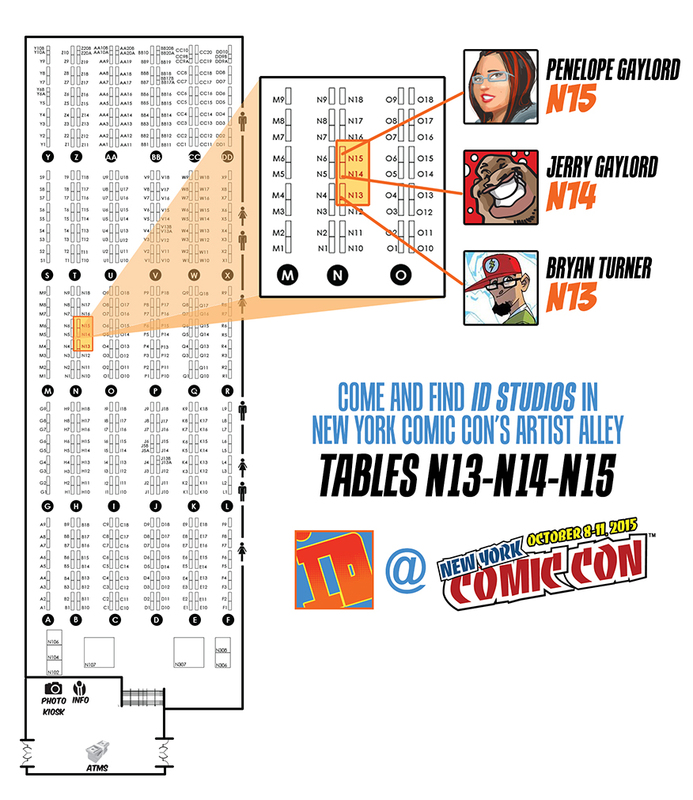 Find us TABLES N13-N14-N15 in Artist Alley at New York Comic Con! it’s already time for New York Comic Con! all 3 members of IDSTUDIOS will be together again, this time we’ll have 3 separate tables in artist alley for maximum dopeness. Bryan “Flash” Turner will be at TABLE N13, Jerry “theFranchize” Gaylord will be at TABLE N14, and Penelope “Peng-Peng” Gaylord will be at TABLE N15. here’s a nice map that leads you straight to us. this time, we’re flanked by some of the coolest ladies of art – Mako Fufu at Table N12 and Whitney Pollet at Table N16. it’s gonna be quite the row of tables and you may never wanna leave. which is totally fine by us. we have lots of new prints, including some new Premium Art Prints and Peng-Peng’s limited-edition Star Wars litho from Acme Archives Direct. we’ve also reprinted some of our mini artbooks that were sold out previously. we’ll have comics that we’ve worked on as well AND we’ll be doing sketches all weekend long. also, theFranchize will be doing a demo at the ColArt booth on THURSDAY from NOON-1PM. he’ll be showing off the new Winsor & Newton Pigment Markers for everybody so be sure to check that out. it’s gonna be one heck of a weekend!